The color is a little weird on the photos in the next few posts. When you have munchkins you gotta do what you can when you can. Thusly, I had to take photos when it was getting dark, plus the mountains of snow we still have outside make things look awfully weird. Anyway, I’ve been looking for an on the go wipe solution for a while. I don’t change tons of diapers while out and about, so the plastic cases tend to allow the wipes to dry out before I use them all. I also think they’re really quite bulky for the amount of wipes in them. I like the little 10 packs of wipes that just come in a pouch with a resealable sticker closure, but I can’t find 10 packs anymore! 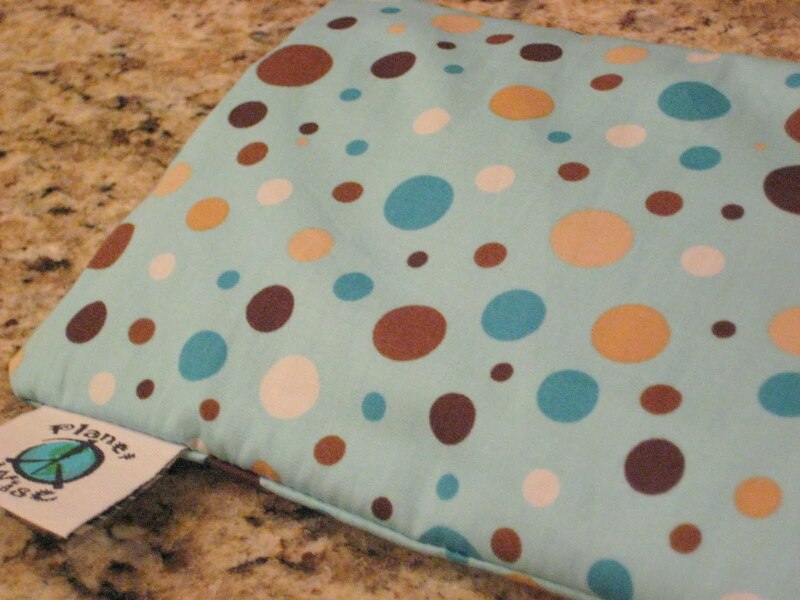 In my wish list post, I was wishing for the Planet Wise wipe pouch but it was out of stock forEVER. I FINALLY got it! Yippee!! I’m wondering if it was OOS so long because it was changed slightly. The photos I saw before had it zippering on the long end, but what I got zippers on the short end. They are stacked and then folded, making the pouch full of wipes really quite trim. They are really quite thin, and single ply. However, folded in half, they are about the same as the double thickness wipes I made out of burp cloths. When you think about it, you don’t want them to be too thick, or you will have a big brick of wipes in your diaper bag. They seemed to shrink in size a good bit after washing, and fluffed up a little bit. I folded each one singly knowing that if I didn’t, I’d end up yanking them all out at once trying to get one. With all ten wipes in the pouch, it was quite fluffy, probably as thick as a plastic travel wipe case. Of course, you can smoosh it if you need to! The very first photo in the post shows it with just 5 wipes in it. 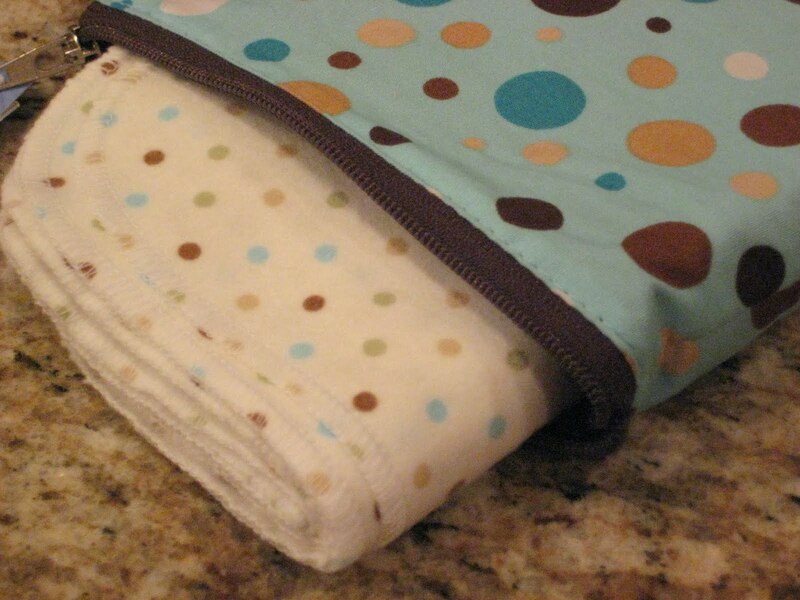 When I’m out and about, I take my wet/dry bag with diapers and wipes. I usually leave this in the car, unless I’m going to be in a single place for a while (like when we go visit my parents). This will work just fine to tuck it in the dry section. The thing I love about Planet Wise bags is that they won’t wick, not even from the zipper (as long as you have it locked closed). So, you can mix up some wipe solution, dunk and wring the wipes, and put them in the wet bag. 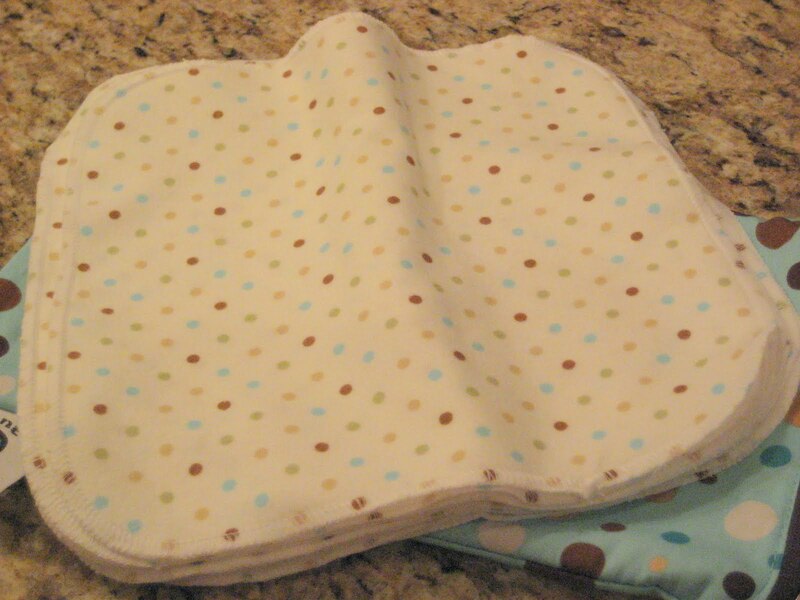 Stick the wet bag in with your clean diapers without worrying about getting them all wet! This brings me to my dilemma (I’m so good at making a long-winded post even more long-winded!) When we’re at home, I just use a squirt bottle. I’ve been looking for a small travel size squirt bottle, but I have several issues. First, even the smallest travel size squirt bottles are pretty large, as well as expensive (in my opinion anyway, $3 for a squirt bottle??) Then I’d have to worry about it getting squished/crushed, dropped or leaking. It takes me so long to go through wipe solution in the squirt bottle, that it would probably get kind of icky after a while. So, I could pre-moisten the wipes instead. I have some issues with that too. I might go a whole week without changing a diaper away from home, then next week I may use 6 travel wipes in a single day. If I pre-moisten them, I’ll be using a lot more solution. Would I pre-moisten all 10, or just 5 at a time? Would I then wash them all when I got home, or would I just wash the ones I used and then freshen up with new solution? Would I wash the whole shebang once a week or so to keep it fresh? I don’t want to over wash and cause more wear than necessary. I don’t want them to sit and get icky, but then I don’t need to add one more step to getting everyone ready and out of the house either (storing them dry and moistening before we leave)! I’ll have to just play around and see how it goes. This is the hardest part for me. I need a plan darn it! It’s so hard to just figure things out as I go. In any case, I still really want to find the little 10 wipe pouches of Lansinoh (my favorite, they smell so good and are so compact!) Pampers, or Huggies wipes to keep in my purse for emergencies. If you see any of the smaller count pouches anywhere, please let me know! >Thank you! I will check there! >If you have a Babies R Us near you go there! I was there tonight and they have the 2 packs of Lansinoh wipes for $2.49. >1-800 diapers has 2 packs of the Lansinoh wipes for $2.49, but the shipping is $4.99! Phooey! >Have you checked the section in the store where all the trial size soaps and shampoos are? I found a 3 oz spray bottle there for my sons wipes and it was like $1. I think they also have small packs of disposable wipes. I found the bottle at Target.